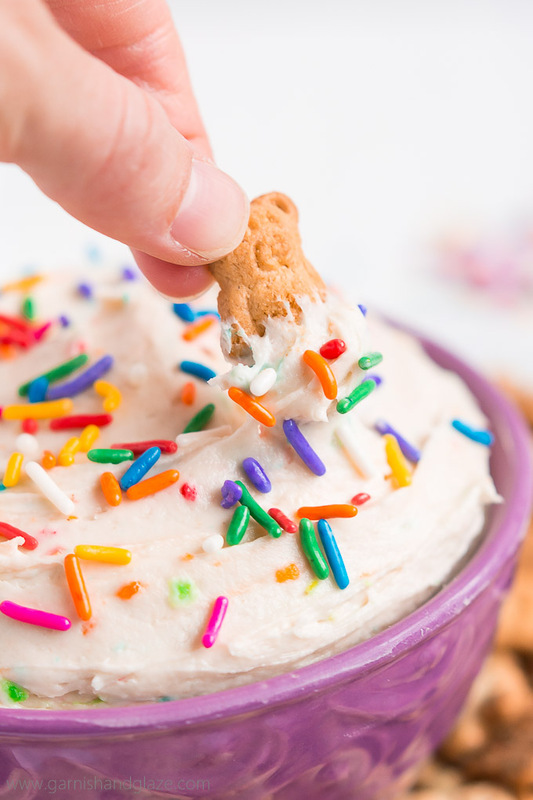 Take 3 minutes and 3 ingredients to make FUNFETTI DUNKAROO DIP and you’ll be eating the most coveted snack in a kid’s lunch… back in the 90’s. 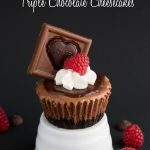 Love frosting? Me too! 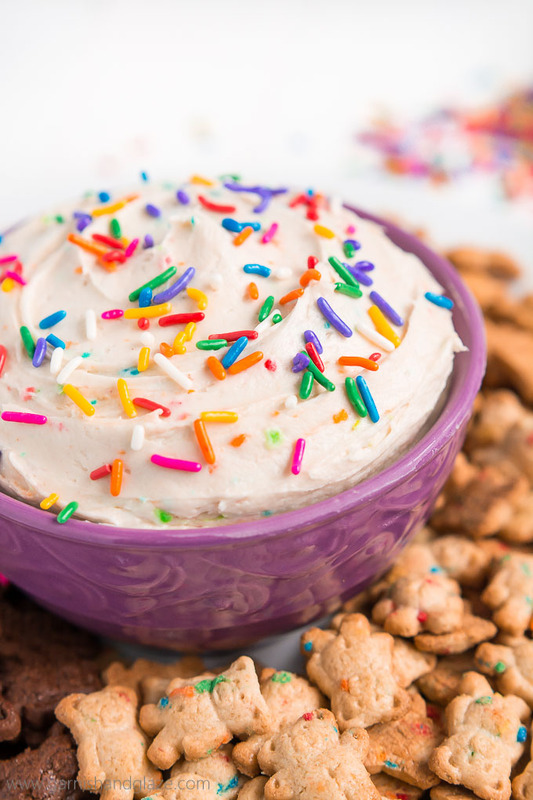 Well now you can enjoy it (with little guilt) like we did back in the 90’s with with Funfetti Dunkaroo Dip! 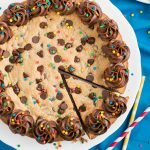 Lunch doesn’t get much better than when you get it end it by dipping cookies in frosting! Now, don’t run away. 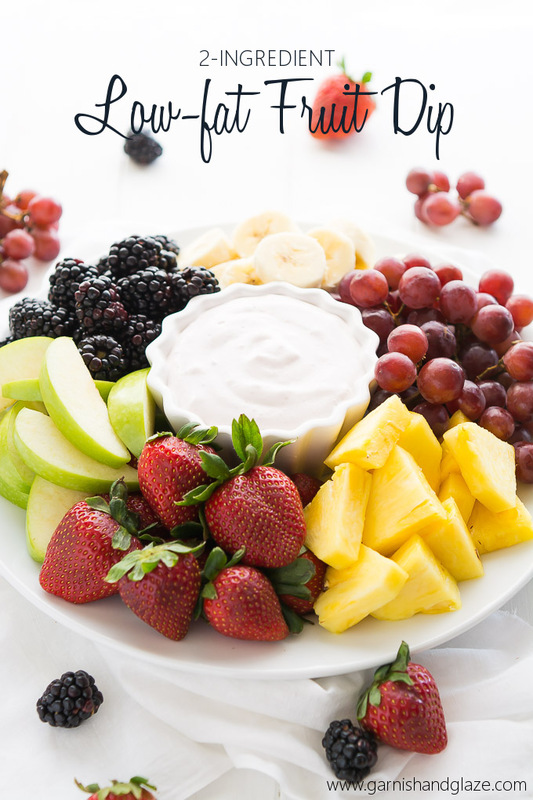 This dip really isn’t as bad for you as you might think. It actually doesn’t have butter or cream cheese in it at all. Say what?!?! Yep yep yeppers! All that’s in this is a box of cake mix (just the mix), lite cool whip, and non-fat Greek yogurt. 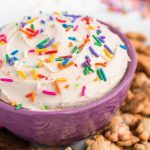 So really, if you are craving frosting, this is the way to go if you’re trying to cut down on calories and fat. I’m not quite sure why they discontinued the product because I’m sure kids would definitely love it. But all is well. I, and now you, can make our own! Who knows, with all the restrictions now days it would probably be confiscated. Those poor kids who grow up on being about to have candy and treats… what a sad life to live. And actually those are usually the ones who try to sneak it and then binge and have disordered eating. Moderation my friends! I digress. Don’t you just feel happy inside when you see sprinkles??? It’s like you’re looking at a little party. So fun and cheerful. Yes, sprinkles do have a strong wax flavor but when you pair it with sweet, smooth frosting you don’t even care. Um, and did you know they sell Birthday Cake Teddy Grahams!?!? How cute are these little guys! As if the original little cookies (or are they crackers??) weren’t already cute enough! 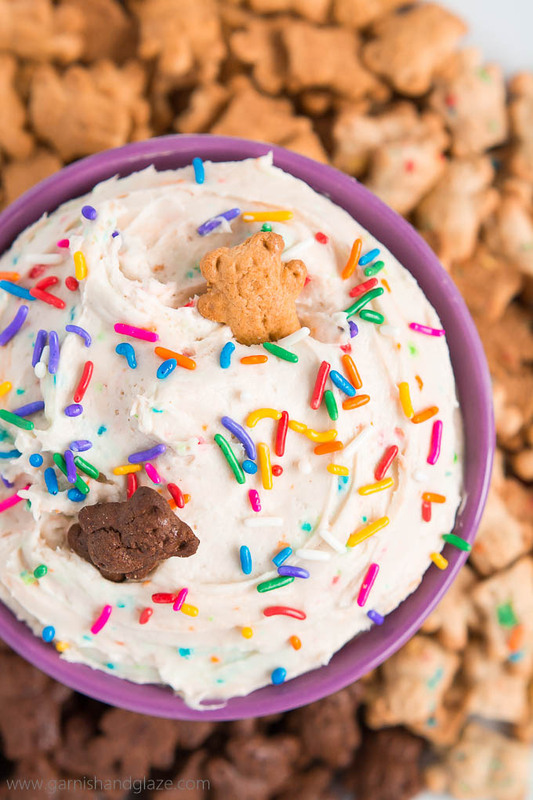 With two little girls, we go through a LOT of Teddy Grahams and now we go through even more with Dunkaroo dip! And it’s not just for kids. My husband kept dipping one cookie after the other. Soooo addicting. You are going to love it! 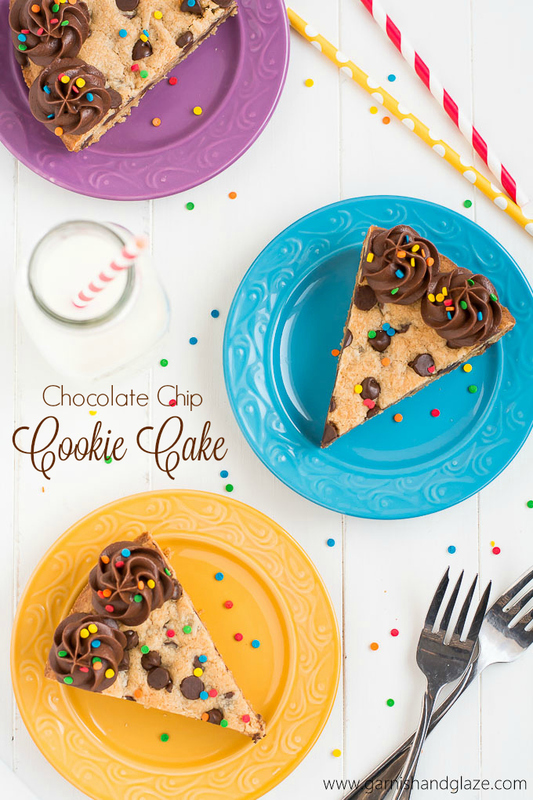 Enjoy it as a snack at home or at a party. It will be a hit! Mix cake mix, Cool Whip, and yogurt together in a bowl until smooth. Serve or place in fridge until ready to serve. 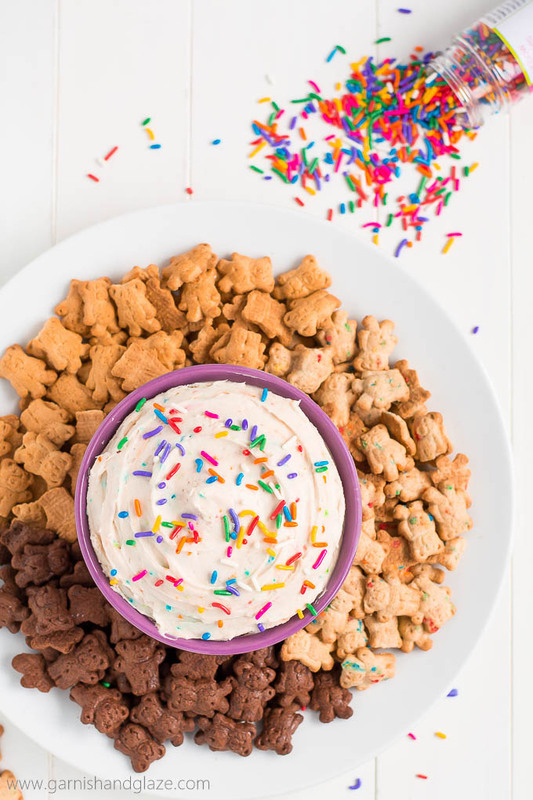 Eat with Teddy Grahams, graham crackers, and animal crackers. 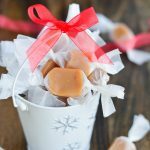 **I first shared this recipe on Spend with Pennies where I am a contributor. Derek and I were just talking the other night about how these aren’t around anymore! We’re totally going to have to make your recipe! Haha! No way?! Perfect timing! You guys will love it! Could you use the can of reddi wip? I haven’t tried that. I think Reddi Whip is thinner so your dip would be quite a bit thinner. 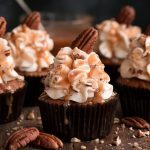 In light of the CDC’s recent warnings that raw flour shouldn’t be consumed in cookie doughs and batters – should we be concerned with the box cake mix not being cooked before it’s eaten? I’m paranoid now. I wonder if you can heat the mix enough for it to be safe? That is a very good and valid concern! You can bake the mix. Just spread it on a baking sheet and bake for 5 minutes at 350. You’ll need to wait until it’s cooled to use it in the recipe.